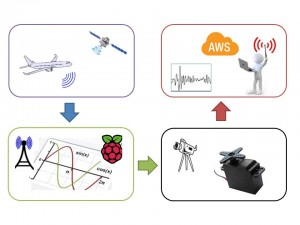 The Pi Plane Project: Tracking and recording planes that fly over your house #piday #raspberrypi @Raspberry_Pi « Adafruit Industries – Makers, hackers, artists, designers and engineers! Hack a day posted about this great project from Simon Aubury. Check out more on his blog here. The Pi Plane Project tracks planes the fly over my house; records a short video – and uploads the clips onto the web. This is a result of a lot of tinkering; and a curious need of mine to combine my love of electronics, programming and aviation. Commercial aircraft in Australia (and a lot of the world) periodically transmit their location and the altitude. Aircraft with ADS-B determine their position using GPS; and broadcast that position along with identity string, altitude (plus other useful information such as speed). Using some inexpensive components, we can build a receiver to listen to these ADS-B signals to track these aircraft as they fly overhead. Using a bit of spunky maths, a bit of electro-mechanical tinkering and a few elastic bands I built a system to determine where in the sky these planes are; point a camera to them and track their movement whilst recording a short video of the flyby. The videos are pushed onto a website; along with basic information such as aircraft type and destination. This flight information is textually overlaid onto the video.